This hat is great on its own or as a complement to the Fashion Forward Cowl. It’s relaxed, slouchy styling fits with any outfit. The ribbing plus the honeycomb cable pattern are warm on a cold winter day. It is worked in the round from the bottom up and the minimal crown decreasing flows organically from the honeycomb body. 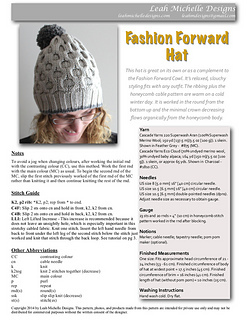 The Fashion Forward Hat is available to purchase as an individual pattern or as part of an ebook set with the Fashion Forward Cowl. If you previously purchased the Fashion Forward Cowl pattern your cost for the ebook set will be $2.00. This pattern requires one skein of Cascade Yarns 220 Superwash Aran plus enough yarn to work the contrast colour stripe and to make the pom pom (which is exactly what was left over from your Fashion Forward Cowl!). Pattern includes notes, list of abbreviations, and the stitch pattern is both written and charted. It fits an approximate head circumference of 21 - 24 inches (53 - 61 cm). Finished circumference of body of hat at widest point = 17.5 inches (45 cm). Finished circumference of brim = 16 inches (41 cm). Finished length of hat (without pom pom) = 10 inches (25 cm). The increase used is the Left Lifted Increase (LLI) which doesn’t leave unsightly holes. A photo tutorial is included in the pattern. A helpful YouTube tutorial can also be found here. Skills required: knitting in the round, cabling with a cable needle making a pom-pom (optional). Stitches used: k, p, LLI, C4F, C4B, ssk, k2tog.